Pond tips for the winter is the first blog we are writing in 2017! Even though the fish are not active, it is still very important to take care of your pond in the winter. You have to keep an eye on the pond, because there are a few things you have to take into account. Consumers ask us a lot of questions in the winter, which we will try to address in this blog about tips for pound maintenance in the winter. Should I feed my fish during the winter? Fish are very inactive during the winter, they are in a rest mode. Actively feeding your fish does therefore not have much use and will only cause more algae to grow in spring, by an abundance of protein. Velda has created special winter feed , for the koi as well as other species, like goldfish and other carp. 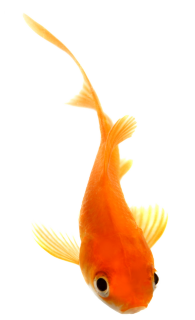 If the temperature of the water is below five degrees, you should feed your fish a maximum of once a week. The winter feed of Velda is sinking feed, because fish often remain at the bottom of the pond in winter times. They do this, because it is warmer there than just below the surface. Do you have sturgeons in your pond? Feed these a little bit more than you would other fish. Sturgeons keep swimming in the winter and thus use more energy. Sanikoi sturgeon food is an amazing product to use in this case. Always keep an eye out for strange behaviour from your fish during the winter. Normally, fish remain at the bottom of the pond. If you see them more on the surface, it may mean a shortage of oxygen or disease phenomena. What do I do when the pond is freezing shut? The freezing of the pond is not necessarily a problem. Make sure, however, that a hole of reasonable size remains for the fish. 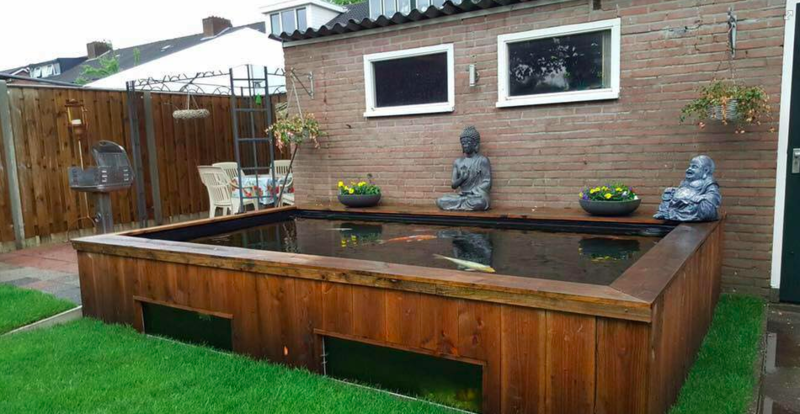 People often think that keeping the pond open is necessary for the oxygen in the water, but the opposite is true. CO2 in the water must have the ability to escape. An abundance of CO2 causes the water to acidify, which is of course not desirable. There are a few simple methods to leave a big hole in your pond. 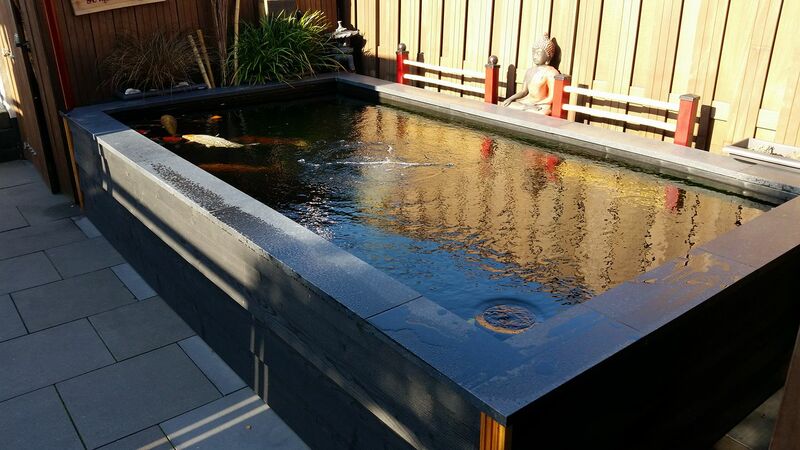 For example, buy a pond heater. Velda has two different pond heaters in its assortment. Moreover, it is possible to place aeration stones in the pond. These aeration stones ensure the water stays in motion and thus can’t freeze. An additional advantage is that it removes the abundant CO2 faster. Don’t place the aeration stones any deeper than ca. 20-40 cm below the water surface. If you place them deeper, the lowest, warmer layers of water mingle with the colder layers, which is not the intention. Do you not have the ability to place pond heaters or aeration stones, place some straw or reed in the pond. Thus, if the pond does freeze shut, at least the abundant CO2 can escape. Do not panic if the pond freezes, despite the measures taken. The fish will, in this case, not choke quickly. If the values of your pond were sufficient and the pond is clean, the fish will not be bothered. However, if the pond is frozen shut for more than a week, you should take action. Never chop an ice hole! The vibrations that arise can cause your fish to enter a state of stress, which could cause them to die. The best advice is to pour some tepid water on the ice, or to place a hot pan on the ice, that melts through the ice slowly. Snow on the ice, is that a bad thing? Snow on the ice is not necessarily a problem. However, it is more agreeable for your fish to get some sunlight in the winter. 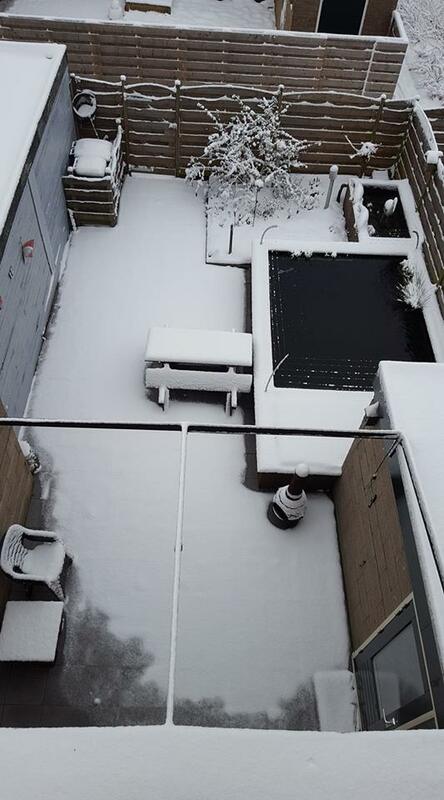 Therefore, remove at least half of the snow from the ice. Do this carefully, without causing too much noise, so your fish will not undergo any stress. What should I do with the technical devices in the winter? One of the most common mistakes people make, is that they clean their filter thoroughly, only to shut it off during the winter. Don’t do this, because it causes the biotope in the filter to stop. By doing this, you destroy the months of construction of the bacterial colony in your filter. It needs this again in the spring, so then you actually start all over again. The newest filters of Venda have a winter setting, with which you put the filter in winter mode, causing the biotope to subsist. You do have to make sure an above-ground filter does not freeze and break. The most ideal situation is when the pond pump is placed sufficiently deep into the water, so that it cannot freeze, or that it is placed on dry land in a frost free location. If you have your doubts about the freezing of the pond pump or pond filter, take the filter and pump inside, just to be safe. UV lights can be taken in during this period, anyway. They do not have any use in the winter. The advice: clean them and store them. Are herons active during the winter? Herons are very active during the winter! Make sure you have a decent protection from them. The newest Laser Guard by Velda is a great product that scares off both herons and cats! If you have already placed a net over the pond in the autumn, leave this on during the winter for more protection. We hope that, by reading this blog, you know exactly what you have to do in the winter. The most important thing is that you grant your fish and yourself some extra rest. Enjoy a lovely winter garden! Below this, you can find some additional tips per month. If you have any questions, please feel free to ask them on our Facebook page.